Bristol City Councils 20 mph review finishes today. 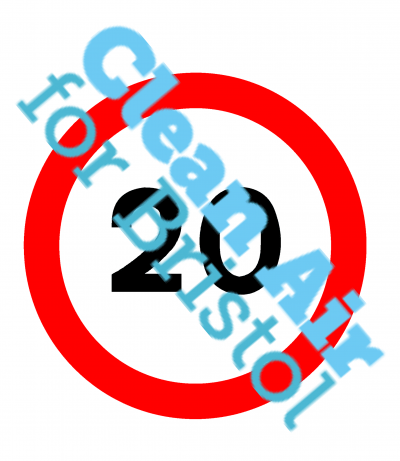 In this consultation, the potential of 20 mph to help meet the National Air Quality Objectives (NAQOs) for NO2 and PM10 emissions, for which Bristol exceeds, has almost completely been ignored. Instead, a Clean Air Zone (CAZ) has been proposed to tackle this as part of central governments Clean Air Framework. A CAZ would attempt to reduce air pollution by encouraging residents and businesses to purchase a cleaner car. A scrappage scheme has even been mooted as a way to kick-start this. A CAZ might encourage some people to leave their car at home but it would have nowhere near the benefits of 20 mph limits. One of the key infrastructure requirements for a CAZ is Auto Number Plate Recognition (ANPR) cameras. These are the same yellow cameras used along the M32 to enforce speed limits. They are one of the most effective measures for speed enforcement, ensuring drivers stick to the speed limits within the zone. Surely it would make sense to simply install these cameras to enforce the 20 mph speed limits that are already in place? Reduce Collisions and lessen their severity when they do happen. A driver seeing a danger travelling at 30mph would have travelled 9 metres before they even pressed the brake pedal and another 14m to come to a stop. At 20 mph the overall stopping distance is half that. This makes a collision less likely in the first place. The kinetic energy of a 1419kg Nissan Qashqai car travelling at 20 mph is 15.7 Wh. If the vehicle didn’t stop in time, this would be the energy felt by the object it hits. Increase this speed by 50% to 30 mph and the kinetic energy goes up by 125% i.e. it more than doubles to 35.4 Wh. To put this in comparison, the energy of a 90kg cyclist at 20 mph is 0.9 Wh and a 70kg jogger at 5mph, 0.05 Wh. This video of an appalling collision in Wales demonstrates the huge amount of energy in a moving car. A car braking from 30 mph to a stop puts more than double the energy through the brakes, tyres and roads than the same car stopping from 20 mph, increasing particulates (PM) from the brakes, tyres and road, contributing to poorer air quality. It also puts more strain on the road surface making damage and potholes more likely. 20 mph has also been shown to reduce noise from vehicles. A car travelling at 20 mph instead of 30 mph can emit almost 10db less noise. 10 db is perceived by the human ear to be a halving of noise. Studies in Sweden, Germany and the UK, have consistently found 2—5 db noise reductions at the roadside from 30 kph (20mph) limits. 20 mph Improves traffic flow and reduces journey time. Countless studies have found 20 mph reduces the concertina effect of traffic and reduces congestion. Acceleration is the most energy-intensive stage of driving. Lower speed limits mean less time on the accelerator pedal and reduced fuel consumption. Considering a hypothetical a 16km journey with 25 stops and starts a car only accelerating to 20 mph will spend nearly a minute less on the accelerator than if it reached 30 mph. Although this does not directly correlate with emissions, a detailed study in London found (unenforced) 20 mph limits reduced NO2 air pollution concentrations at the roadside. Over the past few weeks, Bristol Cycling has been campaigning hard to raise awareness of the 20 mph consultation. The criticism we hear time after time is that 20 mph isn’t enforced* and that “no one really travels at 20mph”. This isn’t a reason to scrap it, it is a reason to do it properly and see what the real benefits could be. We’ve not heard anyone suggest the CAZ could be left to chance police patrols to enforce, so why has 20mph? A reduction in the number of diesel vehicles in favour of petrol vehicles could increase levels of carbon dioxide. In addition, the declaration of a charging zone or access restrictions may result in vehicles re-routing around the zone. This could increase fuel consumption and subsequently carbon emissions. Depending on the measures selected (a CAZ) could restrict access to the jobs or services within the same area. There is potential to disproportionately penalise vulnerable groups in society, depending on the geographic location, scale and the structure of vehicle compliance standards. *The criticism over 20mph enforcement shouldn’t be confused with its legality. Where signs are in place it is an offence for a driver to exceed 20 mph. Recently 20splenty.org published a statement from the Association of Chief Police Officers who have re-iterated the fact that 20mph speed limits are enforceable and where the limit is clearly marked (ie meeting signage regulations) then any offenders may be prosecuted. The police have also developed the option of speed awareness courses for those exceeding 24mph in a 20mph limit and these may be an option in some forces. Fixed Penalty Notices and prosecutions can also be used. In addition “light touch” enforcement can also be used which merely constitutes a reprimand/talk rather than anything more formal. In essence, they are enforced but very few resources are devoted to enforcing them. The latest figures we’ve seen for 2016 in the Bristol City Council area (which were provided in early 2017) show 71% of offences detected are known to have resulted in speeding drivers either attending education, accepting a fixed penalty, or court action, with the rest to be finalised. So the figures do show there is enforcement. The question is, is this enough or do we need to also campaign for better road design to support 20mph?